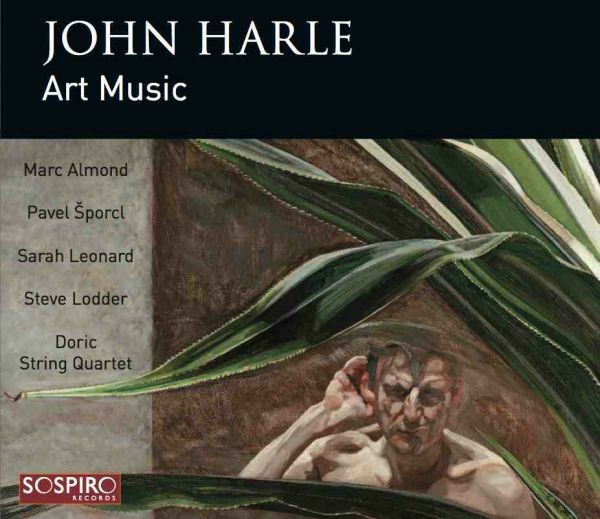 John Harle, the acclaimed, award-winning, British saxophonist, composer, conductor and record producer is set to release Art Music on October 14. The album offers an aural gallery, a sound track, to some of Harle’s favourite paintings. Interestingly these paintings are all by British artists, or artists with strong connections to these isles, and Harle takes inspiration too from the words of one of our greatest artists and poets, William Blake. Partly inspired by Harle’s soundtrack to 'Lucian Freud - Painted Life' for the BBC, (Ivor Novello award for Best Soundtrack 2013/Royal Television Society - Best Original Music 2013), Art Music features original music inspired by the paintings of Lucian Freud, David Hockney, Francis Bacon, John Craxton and John O Connor. Marc Almond sings adapted lyrics by William Blake to music for Harle’s new three-part composition The Arrival of Spring. The album also features noted English classical soprano Sarah Leonard (the voice of Silent Witness), feted Czech violinist Pavel Šporcl and the superlative Doric String Quartet. John Harle and Marc Almond will also collaborate on the composer’s forthcoming album and tour, The Tyburn Tree, which explores the dark side of London and will be released in 2014. Ask Harle what inspired the idea of Art Music and his answer is beguilingly simple: “Music is painting. Music and painting are both about capturing the essence of something. When I see images I hear music at the same time. I paint pictures in music” For Art Music Harle has chosen painters and paintings that give an immediate, visceral, emotional impact and his wonderfully evocative music reflects and speaks to his responses to those paintings. Just as each painting demands it's own response, each of Harle’s evocative pieces finds it’s own voice, as Harle draws on his own rich musical memory and imagination and varied musical output to shape a beautiful, rich aural gallery. Indeed Harle paints his very own Art Music, music that draws from us an emotional, visceral response every bit as rich as the paintings that inspired it and that proves once again that Harle is one of the UK’s most talented artists and musicians in his own right and Art Music one of his finest works. Music is painting. Music and painting are both about capturing the essence of something. When I see images I hear music at the same time. I try to paint pictures in music. Paintings are not only representations of something else - they exist as things in themselves. Paintings contain the artists’ achievements and the artists’ personalities, as music does. Music and painting are bound together by emotion. I have chosen painters and paintings that give me immediate, visceral impact. That impact is emotional and that emotion is immediately music in my head. Emotion is the common language between all art forms that connect - with a viewer or a listener. Emotion that connects through painting or music is the stamp of authenticity in the work. For me, if my music doesn't have an emotional impact on the listener, it has failed. You can judge my music in the first few seconds of hearing it - but you don't have to like everything, just as you don't have to like all art. You can choose. Sometimes my music is simple - a single musical image for a singular image. Sometimes my music is complicated - as life and art are both complicated. If I feel nothing when I see a painting, there is no music. The paintings that you like out of my Art Music Gallery will be the music that you like from my album. There are many differing types of art in Art Music, and different types of music. You can't please everybody all the time - but you can give them choice. I like all the paintings in Art Music, but they all make me feel different things, so the music comes out differently. All the styles of music have a home somewhere in my musical past, and I comment (musically) on the art I react to most strongly. All these painters paint things we recognise - but their way of painting, of looking, makes them special. My music comes from memory and imagination. My musical past and my output is wide, so there musical resources lying in my subconscious that change shape and morph according to what I feel. I try to learn about new things. I learn new instruments and I learn about electronics. As I learn, I recognise the parts of that new thing that I can use. I choose the people I work with because they have something special about the way they sing or play. Marc Almond has depths of emotion in his voice that makes me cry. His Ten Plagues performance at Wiltons Music Hall was a feat of musical memory and vocal athleticism that I believe puts him at the same level as the greatest opera singers I have ever seen. But Ten Plagues was harder than any operatic lead role. He is a true, true genius, and an unaffected and modest man. I am working with him more and more. Sarah Leonard is the voice of Silent Witness. She is unaware of her own power. Her voice is beauty - not a representation of beauty. Pavel Šporcl is the magician of the violin. He is our Paganini. His violin is his soul, and his soul is music. Steve Lodder's piano playing during the whole of this album is an inspiration. He has the greatest emotional range of any pianist I have worked with, and has a rhythmic sense to die for. Lucian Freud's paintings have an outer toughness and edge, but an inner core of simplicity and child-like emotion. I encountered each of the four paintings that I have chosen for Art Music working with Randall Wright on 'Lucian Freud - Painted Life' for the BBC. (Ivor Novello award for Best Soundtrack 2013/Royal Television Society - Best Original Music 2013). With Freud, I couldn't help but relate to him as an outsider - born in Berlin in the 20's and as the grandson of Sigmund Freud drew me to two earlier works - The Refugees is a clear 'outsider' picture - full of mystery and threat, and this inspired my 'Berlin Tango'. The Painters Room is all about dreams and Lucian Freud's omni-present couches - like Sigmund Freud, his subjects, (his 'patients'), were often on couches. It's about dreams - another well of artistic and musical inspiration for many. Interior with Plant Reflection Listening (Self-portrait) inspired music that is complicated and detailed - like the riot of detail in the pot-plant, behind which Lucian Freud is 'listening' - his hand cupped to his ear. What is he listening to? Or is he listening out for something? Reflection (self-portrait) is about simplicity - it's perhaps his most iconic painting, and only a simple, singular musical image would do. David Hockney's 'A Bigger Picture' exhibition at the RA in 2012 had a central room with 52 paintings in it, of which I remember hitting me hard - the sheer magnificence, the awe, and the epic scale was in itself a shattering experience. The monumental scale of The Arrival of Spring in Woldgate, East Yorkshire in 2011 (Twenty Eleven), was so vast I looked to song for a way to express both in words and music what I felt, and as is the case more and more, I found only the poetry of William Blake did that for me. Blake's joy at the arrival of Spring is clear in several poems, and his colossal, musical imagery seemed unsurpassed in anything I've read, including Revelations. 51 of the paintings in the central room were created on an iPad - showing a trust of and playfulness with technology that I share - so, armed with an iPad, I set about composing the songs from a variety of different musical apps. I have intentionally kept the main surface of the music synthetic to reflect the means of it's production, but that of course is set off against one of the most emotional, human and non-synthetic sounds imaginable - the incredible Marc Almond. John O'Connor's series of etchings 'In Nomine' was for me the inspiration for compositional ideas and also about saxophone playing and resonance. The human head has special places within it that make the sound of the saxophone special. If you know where they are, and you use them, your sound has personality and is individual - as each skull construction is individual. John reflected all this (perhaps inadvertently) in his etchings of the English composers John Bull and John Taverner. Taverner's In Nomine' was a plainchant line that became the inspiration for many composers to use as a 'thread' through much English polyphonic music of the next 200 years or so. When John presented me with a painting of myself in the same style, I could do nothing other than write an In Nomine. Francis Bacon's exhibitions seem to always affect me with their anger. Always hard-hitting, always distorted and always shocking. The Study after Velásquez's Portrait of Pope Innocent X is of course one of his most well-known works, but it's power is undiminished for that. I set about composing the music I felt for this painting this in a different way to structured composition - I recorded a solo saxophone line that was gestural at the beginning and then accelerated towards an 'ending' - like a gradual descent into hysteria, ferocity and horror. The music climaxes at the appearance of genuine voodoo voices - coming up from the earth and from the fabric of Innocent's reign. John Craxton - Pastoral for P.W. The island of Crete was John Craxton’s home for decades, and ‘Pastoral for P.W.' was painted after his first visit there in the 1940‘s. Pastoral for P.W. is a celebration of the power of music. The music of Arcadia is Grecian in inspiration - a few traditional folk melodies are present in Arcadia, after I researched the type of folk music that John would have heard in Crete at that time. In a letter, John said that he was also listening to Stravinsky's Symphony in 3 Movements "over and over again at the same time when I first started the painting", and aspects of ’the Evolution section pay homage to the Stravinsky, in an attempt to create something of the aural landscape that John would have experienced during his painting of Pastoral for P.W. As a personal friend, John was always encouraging and colourful in his comments about the music I wrote and played at the Craxton house in Hampstead (where I continue to rehearse and teach), and some of the themes and tonalities in Arcadia are simply the sort of music that would get him enthused, and (almost) dancing.